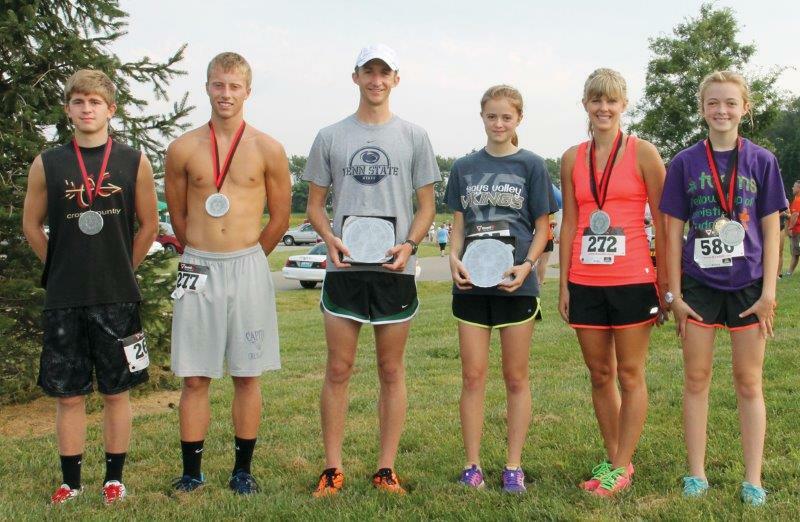 Zach Frank and Meghan Crosby were the top male and female finishers in the Roundtown Classic 5 Mile Run held at the Mary Virginia Crites Hannan Park. Second place finishers were Matt Curtis and Janet Best and third place finishers were Mathias Striebel and Julie Rine. Pictured, from left, are, Striebel, Curtis, Frank, Crosby, Best and Rine. In the 5K run/walk, Cody Pontius and Kristen Noecket were the winners. Second place went to Cody Redman and Rachel Perini. Finishing third were Dylan Newton and Kayleigh Noecker. Pictured left to right are Dylan Newton, Cody Redman, Cody Pontius, Kristen Noecket, Rachel Perini, and Kayleigh Noecker. For complete race results, please click here.